A compact C range pump from Mono NOV has been specified by Church End Brewery to improve process efficiency and handle highly viscous material at its production facility. Church End Brewery in Nuneaton, Warwickshire, produces a wide range of over 40 products, including fruit, herb and chocolate malt beers. Before the Mono progressing cavity pump was installed, the brewery had to manually empty waste from its equipment, a very time and labour intensive process. To provide a solution, the brewery specified Mono’s Compact C Range pump, which has been installed to mix water and crushed barley (the setting of the mash) and then transfer the resultant spent grains at 50 l/min to a storage tank prior to disposal. 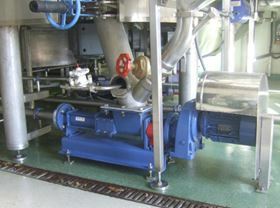 As the mash is a highly viscous product, the pump was designed with a square inlet to assist the product into the pumping element. Stewart Elliot, managing director at Church End Brewery, said: “We had a number of companies quote for the job, but right from the outset Mono stood out from the crowd. They sent someone out to us straight away to analyse the situation and then quickly came back with a very competitive quote. The Compact C Range of progressing cavity pumps has been designed to fit into compact spaces while reliably performing to the maximum duty requirement of the application. The pump uses positive displacement for process control, variable speed for accurate dosing and features a suction lift capability of up to eight metres. A progressing cavity pump consists of a single helix rotor, which revolves within the double helix stator. This action creates a continuous cavity that carries the pumped product intact through the pump as the rotor rotates. The unique design is highly efficient at handling difficult to transfer viscous products and ingredients, such as sugar syrups, sauces, soups and gravies, meat slurries and pastes, with or without solid inclusions and liquids containing entrained gases. This high pressure pump eliminates the need for a series of pumps when pumping over long distances and the gentle pumping action minimises shear or crush damage. Low running speeds and an option of a square inlet and conveyor to assist viscous slurries into the pumping element make it ideal for a wide variety of applications including very abrasive applications. The range can be surface mounted, making it easier, cleaner and less hazardous for maintenance. The pumps are also supplied on a baseplate to ease installation. They can be installed vertically or horizontally to suit the application and can be run in either direction. For ease of maintenance when assembling or dismantling, with extraction facility, the range features a plug in shaft. The drive train is fully sealed to maximise life and minimise downtime and packed gland or single and double mechanical shaft seals are available. There is no air or gas locking in the pump and the positive seal formed by the interference fit between rotor and stator enables the pump to self prime. It also allows tri-phase liquids i.e. solids, gases and liquids to be handled easily. Mono’s Compact C range pumps are available in cast iron or stainless steel, with a choice of rotor and stator materials. Pumps can be supplied to comply with the ATEX Directive 94/9/EC and are also available in standard geometry or extended pitch.